This is the part 2 of the previous article titled Higher Education: Gender Biasness Myth. 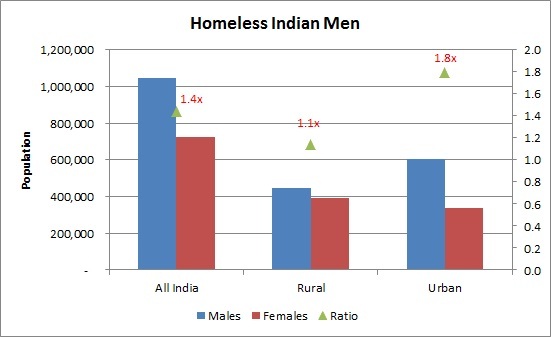 It is been said that women in India are not allowed to study, which is not correct as enumerated by the census data. The fact is quite contrary and completely opposite to the popular belief. If we take the decadal changes in education in India, we can look at Post Graduates in the age group of 20-29. In the field of medicine, we have now more women graduates / post graduates at 183,342 women as compared to 171,843 men in the 20-24 age group. If women are more educated then why do they do not prefer to work? Why should educated women get alimony and maintenance when they are self reliant? Why give bonus marks to women in competitive exams? 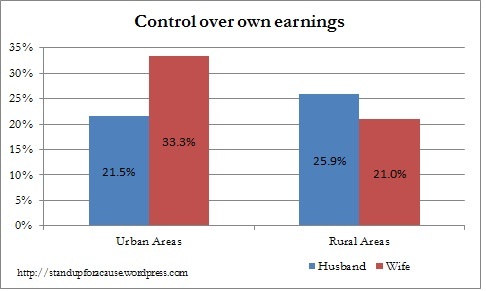 As we can see above a substantial percentage of women have control over their own earnings in the urban areas showing high empowerment as opposed to men. 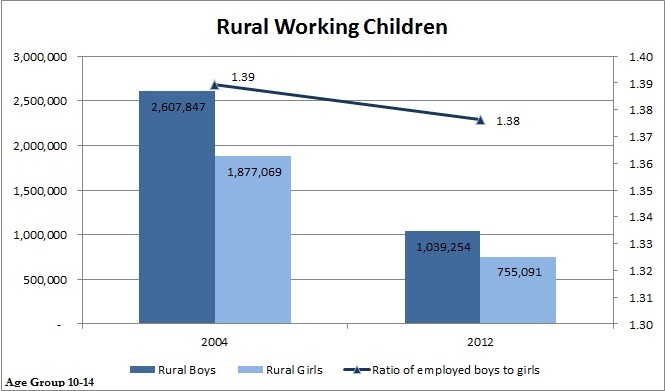 The numbers for rural areas is nearly the same with a tilt towards men. 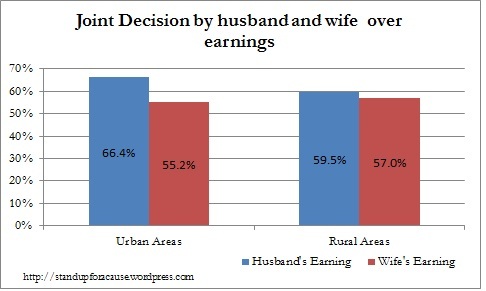 In both rural and urban areas, wife has more joint say in the way the husband’s earnings will be spent and not vice-versa. The empowerment levels in the rural areas is nearly the same with both the percentages not having a wide difference. The above data clearly busts the myth that women are not empowered enough. In fact it shows a completely different picture where men have a lower control over their own incomes. Source: National Family Health Survey – 3 (2005-06), Page 453 and 457, Women’s reports. Education is the pillar for economic growth and development. As a nation develops, the share of Industrial and Services sector increases in the GDP. Employment opportunities are generated and the country requires educated workforce. Economic growth is related to improvement in technology, which in turn is dependent on the availability of researchers in the country. Therefore, education can said to be one of the most important pillars for growth of a country. No wonder every year the Indian government spends crores of rupees on the education sector. Taking into account the total enrollment of students for school education and higher education , the average expense per year for every student paid by the taxpayers comes to Rs. 1142 for school education and Rs. 2776 for higher education. Therefore on an average to train 1 student (who has cleared higher education), the total taxpayer expenditure comes to Rs. 22,030 (12 years of schooling and 3 years of college). Now a question arises why are we discussing the amount spent by our government for higher education. We will shortly come to that question. 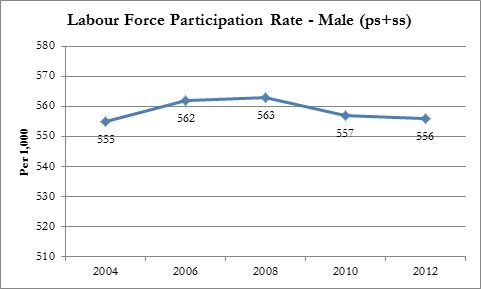 In the meanwhile let up analyse the Labour Force Participation Rate (LFPR) for women in India. 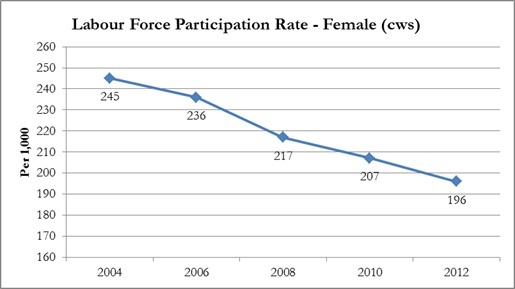 The LFPR for women has been continuously declining since 2004 from 208 to 168 per thousand persons, which is a substantial decline. Every year roughly 1.3 crore women graduate in India, hence in the past 10 years about 13 crores women have graduated. As per the NSS estimate about 0.6 crore women in the age group of 25-34 are working in administrative, technical, professional and clerical roles . Of the 13 crore trained women only 0.6 crore are in the Labour Force. A whooping 12.1 crore women are not working even though they are highly qualified. The taxpayers have spent roughly Rs. 265,816 crores in training these women, who are not contributing to the growth of the economy. These funds could have been better used at some other place which could have provided better economic growth and return on investment. Now an interesting question arises as to why women donot want to work even though they are equally qualified. Often a reason promulgated is sexual harassment at workplace. 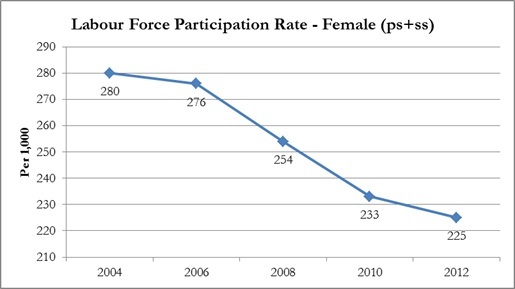 We do have strict sexual harassment laws, still the workforce participation rate is falling. If sexual harassment was the reason, these strict laws ought to have increased the LFPR, which is not the case. Lack of responsibilities on women. All the responsibilities are on men socially as well as legally. Section 125 of CrPC specifically states that men are responsible for the upkeep of their wives and parents. No such responsibility is there on women howsoever qualified she might be. Code 1-4 of NCO-2004 (Ministry of Labour): http://dget.nic.in/nco/CodeStructure.pdf . Calculation Steps: Multiplying the women in workforce (Age 25-34) given on pg 119 with women working in office given on pg 196. School Education: Typically defined as classes I to XII. Higher Education: Typically Universities, Colleges and Stand-Alone Institutions and includes integrated, certificate, diploma, degree, post grad. and PH.D. courses. Note: Do feel free to comment if you have any concerns or suggestions for the article. Your comments / concerns will be suitably included in the article. This is in continuation to the earlier posts which can be found here- Part 1 and Part 2. One of the justifications advanced for women leaving the work force is that they join the part-time labour force. Let us analyze the past years data on Current Weekly Activity Status Approach (cws). According to the CWS approach, a person is considered as a worker if he/she has performed any economic activity for at least 1 hour on any day of the reference week. For details please refer this link. Do feel free to comment and hypothesize any other reason for this trend. I recently got a response to my article ‘Women in Work Force’, that women are leaving the work force because they need to take care of the children. Did women not have to take care of children in 2004? Were women not taking care of children earlier and therefore working and have recently realized over the past decade that they need to take care of children? 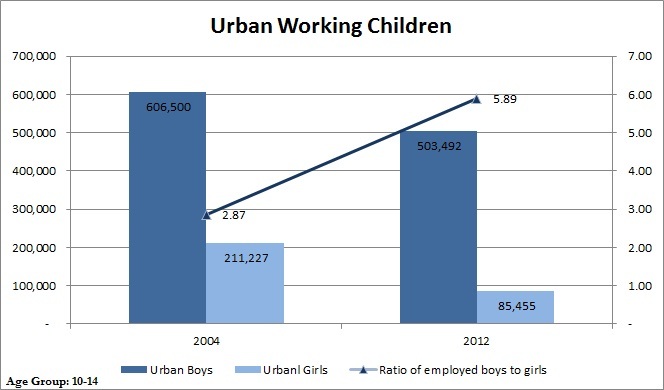 The proportion of children to the total population of India has reduced in the past decade, implying that lesser women-hours are to be spent on taking care of children now as compared to a decade earlier. Therefore logically their participation in the labour force should have increased as opposed to decreasing. As per the census of India[i], the proportion of children in the age group 0-10 years has reduced from 26.5% in 2001 to 22.3% in 2011. This means, now more women should have free time as they donot have to take care of the children. Hence, none of the justifications seem to be backed by facts.